The New Humanitarian | Can elections fast-track development in Sri Lanka’s former conflict zone? Opposition party leaders in Sri Lanka’s north have long called for power devolution to the former conflict zone as a condition for lasting peace, but voters preparing to cast ballots in the Northern Province’s first election since the end of a separatist war in 2009 say power sharing means little if basic needs are unmet. “First we need to be able to take care of ourselves financially before we get into sharing power,” Jeyam Subramanian, a voter from the northern town of Kilinochchi, told IRIN. There are some indications that the planned election has quickened the pace of development work. When Sri Lankan President Mahinda Rajapaksa recently met a high level delegation from China involved in billions of dollars worth of infrastructure projects in the island, he had one request: expedite the work on a nearly 400km expressway that would link the capital, Colombo, with the northern town of Jaffna. This came shortly after he oversaw the opening of a US$150 million garment factory in the northern town of Vavuniya. And less than one week later, the government announced the country’s rail link to the north had reached the town of Kilinochchi from Colombo. The government said it was the first time in 23 years that the rail link, financed by the Indian government, had extended so far north. While according to Roopavathi Ketheeswaran, the top government official in Kilinochchi District, “there have been no instructions to speed up” development work ahead of the elections (slated for 21 September), voters welcome the increased attention anyhow. “We have suffered for long. 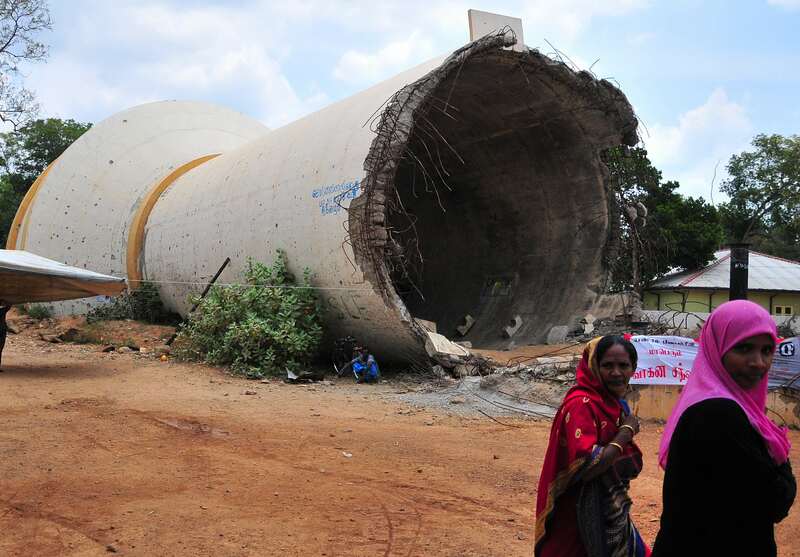 Even after the war [ended], development has been slow,” said Vadivel Shanmuganathan, a voter from Kilinochchi, a town among the hardest hit by fighting in the northern district of the same name. The Northern Province is home to more than 1.1 million people, of whom at least 460,000 are returnees since fighting ended. There is still a funding gap for over 70,000 out of a needed 145,000 houses destroyed during the war. Unemployment in the north is highest nationwide at 5.2 percent, according to the government, though unofficial estimates are several times higher. Candidates standing for election told IRIN that whoever is elected will have to address housing and employment quickly. TNA has faced accusations it is a proxy for the Liberation Tigers of Tamil Eelam, (the armed group that fought for a separate state from 1983 to 2009), something it denies. “Our main campaign point is equal rights in the region. But essential needs like housing, transportation, jobs and agriculture are the pressing issues facing the people right now that would have to be addressed expeditiously,” said Thambirajaha Gurukalarajaha, a candidate in Kilinochchi District from the main opposition party representing the country’s minority ethnic Tamils, the Tamil National Alliance (TNA). Some voters expressed concern that political demands for power devolution - something international election backers (India, the USA, and the European Union) as well as TNA have emphasized since the war’s end - will overshadow unmet needs. Though analysts are looking at the election as a gauge of the government’s willingness to share power, it is unclear what budget the 36-member Northern Council will have (allocations come from central government), or what its governance powers will be. The provincial councils were established in 1987 after the Indo-Sri Lanka Accord as a way to devolve more powers to the provinces. There are nine provinces in the country; eight councils already have elected bodies while the Northern Council has only had an administrative body staffed by public employees headed by an appointed governor. All of the country’s councils, except in Northern Province, are affiliated with the ruling party; there have been nearly no calls for expanded provincial powers from provinces other than the north, where this has been a primary TNA demand. The government has historically not been keen on devolution. President Rajapaksa has ruled out any police and land powers being devolved, a top demand by the TNA. There is a vocal section within the ruling coalition that wants the councils abolished altogether. Nevertheless, voter Shanmuganathan remains hopeful the election can usher in needed development improvements in the north. “It will be a provincial administration with responsibilities concerning the province. Maybe that focus will help us,” he said. Shanmuganathan added he hoped the increased attention the province is getting ahead of the election can translate into more development funds, which have shrunk in recent years.